In a medium saucepan over medium-high heat, saute onion and carrot in margarine or butter until onions begin to brown. Add broth and broccoli. Simmer until broccoli is tender, 5 to 7 minutes. Add cheese and pepper. Heat over low heat until cheese is melted. Serve hot. 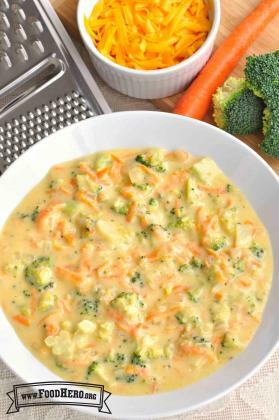 7 Comments for "Broccoli Cheddar Soup"
What would be a good, gluten free substitute for the flour in this soup? Cornstarch would be an easy substitution for flour for thickening. Start with half the amount (2 Tablespoons) since cornstarch is all starch and therefore has more thickening power than flour. I'm curious, does this recipe freeze well? It will probably freeze just fine although there is a chance that the broccoli will become more 'cooked' when it is reheated. We will try to test this and let everyone know. We made the soup, froze it for 10 days and thawed/reheated in the microwave. It worked well! We would suggest freezing it in single-serving portions. Too much additional heating could cause the broccoli to become overcooked which would alter the color and flavor. Really liked this soup! Tastes like a restaurant soup. It does have an onion taste which I really liked but if you don't love onions you could very easily even cut them out and add another veg.